In today's fast-paced, hyper-connected, and mobile/social world, businesses demand instantaneous information and responsiveness. In this environment, businesses must be able to move as fast as their customers, be they B2B or B2C, to deliver the experience those customers demand. For years, technology companies have been talking about the "real-time" enterprise. And for years, that's all those vendors delivered -- talk -- because they didn't have the necessary range of world-class technologies to deliver on the real-time promise. But today, Oracle is changing that paradigm, because only Oracle can bring together for customers optimized in-memory capabilities across applications, middleware, databases, and systems. Oracle Database In-Memory transparently extends the power of Oracle Database 12c to enable organizations to discover business insights in real-time while simultaneously increasing transactional performance. With Oracle Database In-Memory, users can get immediate answers to business questions that previously took hours to obtain and are able to deliver a faster, better experience to both their internal and external constituents. Oracle Database In-Memory delivers leading-edge in-memory performance without the need to restrict functionality or accept compromises, complexity and risk. Deploying Oracle Database In-Memory with virtually any existing Oracle Database-compatible application is as easy as flipping a switch -- no application changes are required. It is fully integrated with Oracle Database's renowned scale-up, scale-out, storage tiering, availability and security technologies making it the most industrial-strength offering in the industry. At a special event at Oracle's headquarters, CEO Larry Ellison described how the ability to combine real-time data analysis with sub-second transactions on existing applications enables organizations to become Real-Time Enterprises that quickly make data-driven decisions, respond instantly to customers' demands, and continuously optimize key processes. "As a consumer Internet pioneer and innovator, Yahoo is always at the leading edge of big data and database technology to deliver a responsive, seamless consumer experience. We joined Oracle's beta program to understand how memory optimization could sharpen our big data processing," said Sudhi Vijayakumar, Yahoo's Principal Oracle Database Architect. "Full support for Oracle Real Application Clusters' scale-out capabilities means Oracle Database In-Memory can be used even on our largest data warehouses." Oracle Database In-Memory enables customers to accelerate database performance by orders of magnitude for analytics, data warehousing, and reporting while also speeding up online transaction processing (OLTP). An innovative, dual-format in-memory architecture combines the best of row format and column format to simultaneously deliver fast analytics and efficient OLTP. 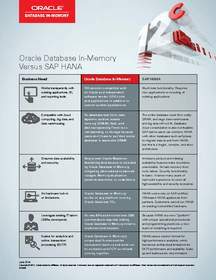 Oracle Database In-Memory allows any existing Oracle Database-compatible application to automatically and transparently take advantage of columnar in-memory processing, without additional programming or application changes. Oracle Database In-Memory demonstrated from 100x to more than 1000x speedup for enterprise application modules in performance tests, including Oracle E-Business Suite, Oracle's JD Edwards, Oracle's PeopleSoft, Oracle's Siebel, and Oracle Fusion Applications. The ability to combine real-time data analysis with sub-second transactions on existing applications enables organizations to become Real-Time Enterprises that quickly make data-driven decisions, respond instantly to customers' demands, and continuously optimize all key processes. Oracle Database In-Memory has undergone extensive validation testing by hundreds of end-users, ISV partners, and Oracle Applications teams over the past nine months. Oracle Database In-Memory is scheduled for general availability in July and can be used with all hardware platforms on which Oracle Database 12c is supported. Oracle PartnerNetwork (OPN) is also announcing that Oracle Database 12c Ready certification will soon include Oracle Database In-Memory. Maximum Availability Architecture to protect against data loss and downtime. Scalability to meet any requirement via scale-up on large SMP servers, scale-out across a cluster of servers, and storage-tiering, to cost effectively run databases of any size -- whether petabyte-scale data warehouses, big data processing or database clouds. Rich programmability: Java, R, Big Data, PHP Python, Node, REST, Ruby, etc. Full data type support: relational, objects, XML, text, spatial, and new integrated JSON support. Oracle Engineered Systems, including Oracle Exadata Database Machine and Oracle SuperCluster, are optimized for Oracle Database In-Memory, featuring large memory capacity, extreme performance, and high availability while tiering less active data to flash and disk to deliver outstanding cost effectiveness. In-Memory fault tolerance on Oracle Engineered Systems optionally duplicates in-memory data across nodes enabling queries to instantly use a copy of in-memory data if a server fails. New Direct-to-Wire Infiniband accelerates scale-out for in-memory. Oracle's M6-32 Big Memory Machine is the most powerful scale-up platform for Oracle Database In-Memory providing up to 32 Terabytes of DRAM memory and 3 terabytes/sec of memory bandwidth for maximum in-memory performance. "We are delighted that our MicroStrategy Analytics Platform is among the first third-party applications to be certified with Oracle Database In-Memory," explained Paul Zolfaghari, President, MicroStrategy Incorporated. "Our participation in Oracle's beta program and integration with Oracle Database In-Memory builds on our long-standing relationship with Oracle, underscoring the importance of working together to optimize our platforms to extend the advanced functionality and speed performance improvements to our joint customers." "Oracle is the only vendor in the industry to embrace in-memory computing from applications to middleware to database to systems, enabling businesses to maximize profitability by accelerating operations, quickly discovering new growth opportunities and making smarter, real-time decisions," said Andrew Mendelsohn, Executive Vice President, Database Server Technologies, Oracle. "Oracle Database 12c In-Memory uniquely delivers unprecedented performance for virtually all workloads with 100 percent application transparency and no data migration. Plus all the high availability, scalability, and security that customers have come to expect from the Oracle Database are fully preserved." "Oracle Applications provide the foundation for our customers' mission-critical business operations, including sales, financials, supply chain and human resources. By raising the bar on speed, Oracle Database In-Memory enables customers to compound the value of their existing applications by deriving new insights and business opportunities faster," said Steve Miranda, Executive Vice President of Application Development, Oracle. Oracle engineers hardware and software to work together in the cloud and in your data center. For more information about Oracle (NYSE: ORCL), visit www.oracle.com.